Dr. Natasha Kapoor is excited to be working at Dental 365. She loves seeing patients and hopes to ameliorate their oral health in any way she can. She graduated with her DDS in 2010 from Virginia Commonwealth University. She then completed a 2 year General Practice Residency at Jamaica Hospital in Queens, NY. In 2015, she graduated with a M.S. in Periodontics from University of Detroit Mercy. She is a board-certified periodontist. 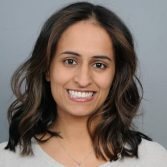 In addition to practicing, Dr. Kapoor also enjoys teaching and is Assistant Clinical faculty at Columbia University School of Dental Medicine. She is a member of the American Academy of Periodontology, American Dental Association, and Academy of Osseointegration. In her spare time, she enjoys walking, playing badminton, reading books, and spending time with friends.